For the first time ever, a streetfight broke out between two TUF coaches. It was bound to happen. 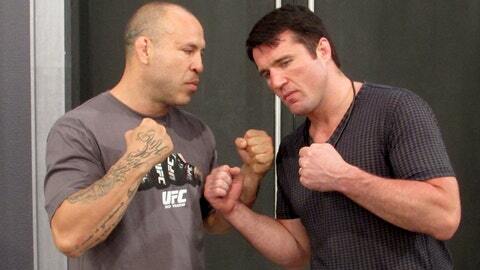 After years of antagonizing each other but only a few days of being in close proximity to each other, Chael Sonnen and Wanderlei Silva have apparently thrown down. According to UFC president Dana White, the two opposing coaches of the upcoming season of The Ultimate Fighter: Brazil got physical on the set of the show sometime on Monday. “They literally fought,” he said during a Monday media lunch in Los Angeles. At first, White didn’t seem to want to talk too much about it, although let’s be honest, the altercation makes for publicity to build up the upcoming season. So, of course, he went on, providing a few details. White did not say whether the brawl was captured on camera, but generally, coaches are taped whenever they are on the set. While they were fighting, one of Wanderlei’s guys sucker-punched Chael. They went crazy. Crazy s**t happened there. . . . it went on for a while. The original beef between the pair stems back to around 2010. Sonnen had just concluded his first fight with Anderson Silva, during which he had several disparaging things to say about Silva and other Brazilian fighters. During a mutual van ride to a UFC event, Silva voiced his displeasure with all of Sonnen’s remarks. It wasn’t long before Silva became a frequent target of Sonnen’s both in interviews and on Twitter. During a Sept. 2013 Mr. Olympia event in Las Vegas, the two nearly came to blows when Silva confronted Sonnen during an autograph signing and the two needed to be separated. Just weeks later, White revealed the two would coach against each other and finally resolve their feud in the octagon. Before jetting off to Sao Paulo, Sonnen requested extra security during his time filming. Taping began about two weeks ago, and while there has been tension, nothing had boiled over until Monday. Ironically, earlier in the day the UFC released a video of Sonnen discussing his experience thus far with some confusion about Silva’s rapidly changing moods. It will be a long time until the sequel to Monday’s fight; the actual sanctioned fight between the two isn’t set to go down until July. Until then we’ll have to settle for the abbreviated TUF version, and the many verbal shots that are sure to come.